Oh…poor, poor you! Being forced to put your poor, English eyes through that jarringly American jargon! I’m glad you made it through! I sense the faint odour of sarcasm in your reply. However, there are two points I should maybe make more clearly. 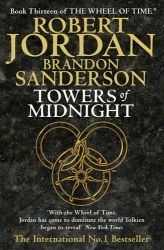 Firstly, in a world that it based on medieval or early Renaissance Europe (Andor is supposed to be England-like, the Two Rivers resembles Ireland, Cairhien is based on French culture, Tear on Spanish, Illian on Greek) it is anachronistic to have the characters talk like American teenagers. Secondly, I believe Robert Jordan himself, being from an older generation, did not put such words and phrases into his characters’ mouths (although it’s a while since I read the earlier books). While he had flaws as a writer, he at least had a greater mastery over language – lexical field, register, sheer grammar – than Brandon Sanderson seems to have.